I guess by definition I am insane. I did the same thing over and over and expected a different outcome. As a musician, I performed at numerous events for free, even when the company or organization had money to pay. I justified it in my head that it was “good exposure” or that I was being a “team player,” or, the BIG rationalization, that “they would pay me next time.” But, next time came and they just expected me to do it for free again. I estimate that it cost me an average of 15 hours per event when adding up the time it took to organize a play list, rehearse, travel, set-up, perform, and pack-up. Even if I only charged $10/hr for my time, that’s $150 times hundreds of performances. Value your time and talent because you are just as worthy as anyone else. As an independent online marketing professional, I love helping small businesses get started with websites, social media, and initial marketing plans. I have built many sites for free or at drastically reduced costs, only to have them expect more for free. I’ve done work for many friends to help them get a business started, only to have them drop the business before it ever gets off the ground. I have done many extra tasks that were not part of the “Agreement” but that needed to be done. And, there have been countless hours dedicated to helping non-profits because they couldn’t afford to hire someone, only to have them hire someone later and erase everything I created. In the end, I just felt used and it was my own fault. By giving away my time and talents, I was essentially telling people I wasn’t valuable enough to get paid. So, who could blame them when they wanted more work for free? Sure, there are some deserving people who need a little help that you can provide, and they WILL greatly appreciate what you do. But, choose your donations wisely, and limit your free services to 1-2 projects a year, if that. Unless you are independently wealthy, don’t make the same mistakes I made just because you want to be “helpful.” Value your time and talent, because you ARE just as worthy as anyone else, and you deserve to be paid a fair price for the work you do and the skills and talents you possess. That free time you give away will never come back, so be very protective of it. Trust me when I say that over time, if you keep giving yourself away, it takes it’s toll and you forget just how valuable you are. You deserve to be valued. You deserve to make money. You deserve to be successful. 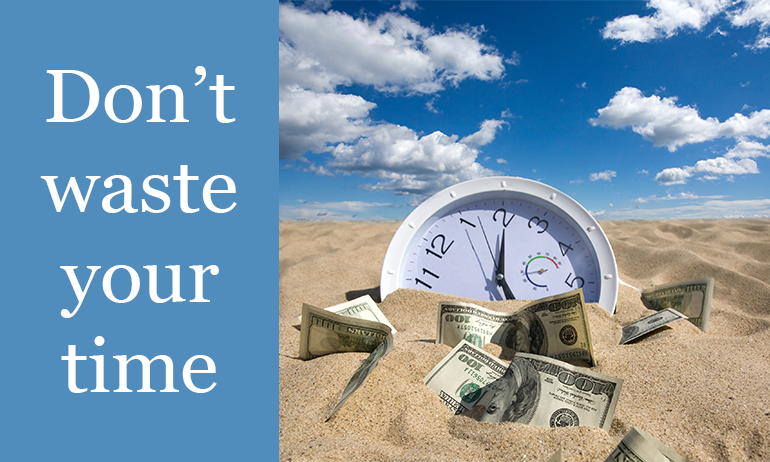 So, stop wasting time and start getting paid!